The Pension is situated in a part of the town which is called Horni Brana in Romerská Street, in one of the oldest houses here. This hotel has been recently reconstructed so it can meet requirements of guests ensuring comfort. During your stay you will feel the magic of this historical town. The city centre and the bus station is only six minutes walk away. 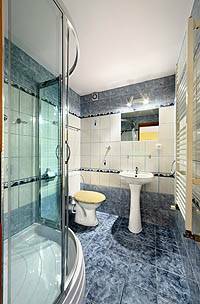 We take for granted that all rooms are equipped with private bathrooms, either shower or bath and WC. There is also a dining room and a large garden with BBQ, where we serve a breakfast or you can stay there during the day or evening in a relaxing atmosphere. All rooms are equipped with TV & radio and Wifi Internet connection. We offer bikes and boats for rent, for our guests for special prices. With pleasure we give you tips for trips in surroundings of Ceský Krumlov. After your request we are able to ensure tickets for cultural performances that are held in the town. On your arrival we can pick you up from bus or train station!!!!!! Accommodation is possible during the whole year with parking in front of the house or in the garage. We are confident that you will have a pleasant experience with us. Double room, wooden floor or a carpet, the rooms are equiped with a wooden furniture. From all rooms a view on the old town, minibar TV and Radio, bathroom and WC on every room. One Child uner 3 years old can stay for free in existing bedding. 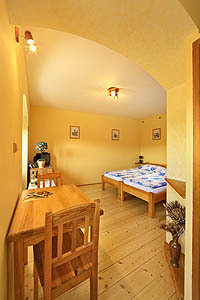 Triple room, wooden floor, the room is equiped with a wooden furniture. From the room is a view on the old town. Bathroom and WC on every room. 1 child under the age of 3 can stay for free sharing the existing bedding. Suite for 4 people, 2 separates double rooms, wooden floor, the rooms are equiped with a wooden furniture. From all rooms a view on the old town. Bathroom and WC on every room. 1 child under the age of 3 can stay for free sharing the existing bedding. Way from Vienna: from airport use highway A4, then go to highway A1 direction Linz. In Linz use way B126 direction Bad Leonfelden and cross the border to Czech republic in Studanky. In Vyssi Brod turn to way 160 direction Rozmberk and Cesky Krumlov. From Vyssi Brod is just only 28 km to Cesky Krumlov. And if you cross first bridge in Cesky Krumlov and second street turn right and go up. Then continue 200 m and go left and after another 10 m you´re in the front of our Penzion. Or if you come by train or bus, the easiest way is a catch a taxi:from train station it costs 4 Euro´s, from bus station only 2 Euro´s.